Canon, the iconic camera brand, recently announced it would expand its “Explorers of Light” program to include influencers. By adding 40 amateur photographer influencers from a variety of trendy topics (including beauty, travel, and food) to its stable of 42 professional photographer content creators, Canon seeks to counteract the revolutionary effect that smartphones have had on photography. They ran a survey in October that found that, "73 percent of influencers own a DSLR camera, and 86 percent said that a camera is the most important tool they use to create content," making influencers both the ambassadors for and the target of their campaigns. They’re just one of many companies that are maintaining programs of influencers to regularly feature a brand as a part of their lifestyle, rather than just one-off campaigns. Massive brands like Amazon, Sperry, and NA-KD Fashion maintain active affiliate programs to engender fruitful long-term relationships with influencers – and they reap the rewards. Authenticity is the key to running a successful influencer campaign – letting influencers tell their own stories about a brand yields better results for both the brand and the creator. These partnerships allow brands to consistently interact with their target audiences through an influencer’s content. Canon is just the latest example of brands wisening up to the power of influencer marketing, as they leverage creative insights to target key audiences. mmDust, a partnered Twitch streamer, faced criticism after he made some controversial comments at TwitchCon last week. He intimated that he felt he was “better than the average person,” citing this as justification for not engaging with his audience. Though mmDust is known for not being ‘friendly’ to his audience like other streamers, his comments were construed as egotistical and narcissistic. After issuing a lengthy apology, mmDust is streaming yet again with little-to-no consequence. This is certainly not the first time an influencer has caught flack and been forced to apologize. Some even build their brands on controversy and drama, like Logan Paul, while others have faced international scrutiny for their content, like YouTuber PewDiePie. The common thread among the above-listed examples is that despite the controversy and viral backlash, each has rebounded and maintained their varying levels of followers, while others have been buried for lying, buying followers, or saying and doing offensive things. The business of influence is evidently mercurial: there’s no clear cut set of rules and expectations for an influencer to retain an audience. 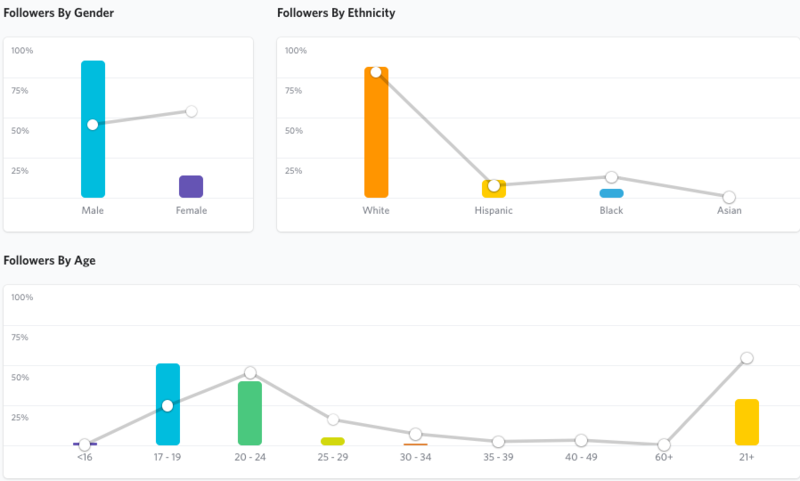 Often it comes down to the demographics of the audience to understand their appeal: 85 percent of mmDust’s followers are men, and 90 percent of his followers are aged 24 or younger. Julius tracks such data for this reason – leveraging audience insights allows our clients to make the best decisions about what influencers to use and what content they are best at producing. FaZe Clan, an influencer conglomerate of sorts that manages over 90 esports gamers and influencers, is hiring a “house manager” for one of its Hollywood mansions. The ‘clan’ houses its members in three separate mansions – one for its owners, one for its Fornite clan, and the “clout house” – to spur creativity, create content, and keep all its influencers under one roof. The clout house, home to popular influencers RiceGum, Alissa Violet, Sommer Ray, and Ricky Banks, is featured in many of their videos, and is arguably key to their sustained success. FaZe is not the only group of influencers to live together: controversial YouTube stars Logan and Jake Paul also live in Hollywood with fellow influencers and are often criticized for their antics. Multichannel networks, clans, and groups of influencers are on the rise in the industry. Living together engenders creativity, streamlines content production, and combines the power of their influence under one roof. FaZe is one of the first to do this, capitalizing on the meteoric success of the “clout gang” and the competitiveness of their esports team. As the industry grows, expect more mansions, more vlogs, and more shared housing. Be on the lookout for more information on our next influence live event, tentatively scheduled for the end of the month. Hear first hand accounts from industry insiders, influencers, and brands in a conversational format for unparalleled insights.